Since things are going to stay exciting this week in the realm of American politics and world events I decided to take it easy tonight and post a portion one of my Civil War texts, A Great War in a Revolutionary Age of Change. This section of that chapter deals with the developments of the American artillery branch from the Napoleonic period until the Civil War. I figured I needed to relax a bit and truthfully artillery gives me a serious woody. I started my military career as a forward observer in the National Guard back in 1981 before all the GPS and computer stuff and I tell you there is nothing like calling in 155mm artillery fire and seeing it obliterate a target. I know that sounds bad, but don’t knock it until you have tried it, and back in those days the life expectancy of a Forward Observer if we went up against the Soviets was measured in minutes so allow me that because I haven’t been allowed to do it since 1983 when I was commissioned as a Medical Service Corps officer and later became a chaplain. I am sure that there are some artillery geeks out there so if you know one please share this with them. Like the infantry and cavalry the technical specifics and tactics of the artillery of the United States Army had their roots in the Napoleonic era. Artillery theory “emphasized both the offensive and defensive role of field artillery, with the emphasis on the offensive role in support of infantry assault tactics.”  Much of this was due to how Napoleon, a master of artillery tactics, employed his artillery. Napoleon depended heavily on his artillery, he “liked to assemble them in a Grand Battery and use them as an offensive, as against a defensive weapon. At Wagram, in 1809, Napoleon had torn the heart out of an Austrian army with a Grand Battery of 112 guns.”  Napoleon would also use a tactic called the artillery rush in which just prior to launching an attack, “the greater part of his artillery reserve would rush to the front. An intensive bombardment would pulverize the opposing line at the point of assault.”  If successful he would unleash his heavy and light cavalry in pursuit of broken enemy formations, if not, the guns would cover the retreat of the assault troops. One of the most important aspects of Gribeauval’s system was that it touched “nearly every aspect of cannon design, construction, carriages, and deployment, the so-called Gribeauval System served France into the Napoleonic Era. It was so far reaching that it also profoundly influenced artillery in other nations, including that of the emerging United States”  which adopted the Gribeauval System in 1818. American Army officers had long been in the thrall of Napoleon and had been educated in Napoleon’s theory of war by Napoleon’s Swiss interpreter, Henri Jomini, through Denis Hart Mahan, the first military theoretician of the United States who had studied in France and taught at West Point. As such the army sent officers to France to study, among them was Lieutenant Daniel Tyler who went to France in 1828. He translated all of Gribeauval’s System and noted that the French were in the process of adopting British designs of weapons and accouterments, which they had found to be superior to the older designs. Tyler recommended that the Army continue with the Gribeauval System. One of these advancements was the stock-rail carriage to mount artillery, which was superior to the Gribeauval designs. Janice McKenny, in her book The Organizational History of Field Artillery 1775-2003 noted that Tyler also translated copies of the French evaluations of British designs, and “obtained complete drawings and specifications of the Système anglais modié, which the Americans later named the “stock-trail system” after the design of the carriage. The new trail consisted of a solid block of wood, simpler and stronger than the old split-trail then in use by the American army, and was significantly superior in maneuverability.”  In response to Tyler, some American designers “began fabricating stock trail prototypes”  from Tyler’s drawings. However, it took over a decade for the Army to adopt the design, but once adopted the army would use the stock-rail system for its field artillery guns until after the Civil War. This was in large part due to the work of Captain Alfred Mordecai, who traveled to France in 1833-1834 and collected data on the French development of the stock-rail system. His information, “which included detailed drawings, became the basis for U.S. prototypes of the design.”  An Ordnance officer, Mordecai went on to become head of the Frankford Arsenal and later was appointed to the Ordnance Board where he wrote the 1841 Ordnance Manual for the Use of Officers in the United States Army. Mordecai was instrumental in standardizing weapons types and carriages. The guns of his 1841 Pattern, 6- and 12-pound guns, as well as the 12-pound howitzer were all mounted on a standard carriage. Larger weapons, the 24- and 32- pound howitzers of the 1841 pattern were developed but did not see as much service due to their weight. Additionally, limbers and caissons were redesigned to lighten them and improve mobility. Though approaching obsolescence, many these guns saw action in early part of the Civil War and Confederate artilleryman Porter Alexander noted that the 24-pound howitzer was “his favorite gun” for the effectiveness of its heavy shells and canister. The artillery service in United States Army was organized like the French army into batteries of six guns, which in turn were detailed to brigades, regiments or battalions. The regimental system was adopted in 1821, following discussions by Secretary of War John C. Calhoun and Congress. As a result, the existing artillery of the army, “the Corps of Artillery and the Regiment of Light Artillery were consolidated to form the 1st, 2d, 3d, and 4th Regiments of Artillery. One of the nine companies authorized to each of the four regiments was to be equipped as light artillery…. The number of artillery companies was reduced from forty-two (thirty-two in the Corps of Artillery and ten in the Regiment of Light Artillery) to thirty-six in the four artillery regiments.”  The units were dispersed at forts as coastal artillery and depots around the country. Most of the artillery companies of the period were maintained well below strength and none were organized as horse artillery. 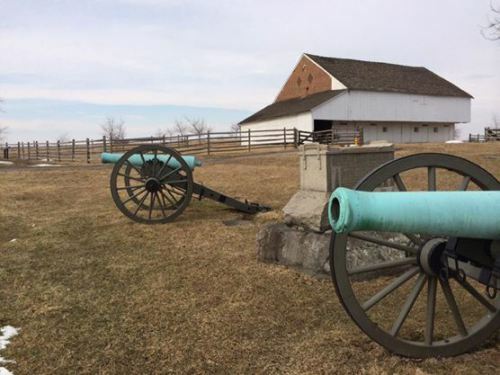 In order to give artillerymen practical experience and training working as part of a larger force, Calhoun and the Army established an artillery school at Fortress Monroe. This was an important step. The mission of the school was to provide artillerymen the necessary training in the science of gunnery and artillery tactics, which could not be accomplished in isolated posts. To ensure that the total force was trained the army determined that, “ten artillery companies were to be drawn from the four regiments and assembled as the Artillery Corps for Instruction. The faculty was to be selected from the artillery at large. Through a plan of rotation, all artillery companies were eventually to pass through the school. Cadets assigned to the artillery after graduating from West Point were to receive a year’s instruction at the school before joining their regiments.”  The school was closed in 1835 due to the demands for artillerymen in the increased number of coastal fortifications and the need for troops to serve in Florida against the Seminoles. Most of the improvements in artillery design between the Napoleonic era and the Civil War were on focused on lightening the weight of the tube, developing better and more mobile limbers, and improvements to fuses and ammunition. During this time the smoothbore cannon reached the apex of its development. In the United States this was realized with the brass M 1857 12-pound Napoleon, which was developed from a French design, however the gun “embodied none of the recent advances in technology” and was “already considered obsolescent by the French Army.”  However, much of the choice was dictated by purchasing agents and the budget which required any new ordnance to be cheap. 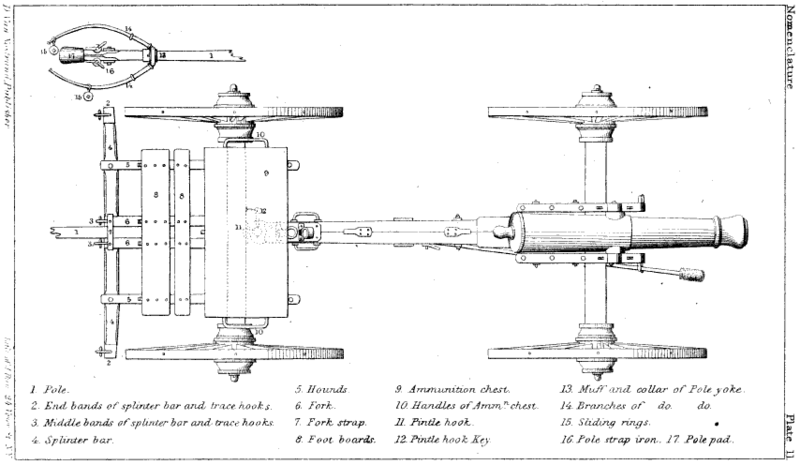 The Napoleon was intended to replace the 1841 patter 6 and 12 pound guns and the 12 pound howitzer. It was nearly 500 pounds lighter than the old guns and “though it was technically a gun, owing to its ability to fire canister and solid shot, the Napoleon was often referred to as a gun-howitzer for its ability to fire explosive shell.”  It would see its first action at the Battle of Bull Run and nearly 1,800 of these versatile cannon would be produced in Northern and Confederate foundries during the war. Despite its obsolescence it “proved to be the most popular field piece during the Civil War,”  and Union artillery General Henry Hunt later acclaimed the Napoleon as “the best all round field piece of this era.” Robert E. Lee told the Prussian observer to the Army of Northern Virginia, Justus Scheibert: “Nothing surpasses… the impression of a battery of 12-pound smoothbores which approaches to within 400-600 paces of the enemy…. In such moment rifled artillery, the advantages of which in open country I fully appreciate, cannot replace the smoothbore.”  Some of these guns remained in service until 1880. While the development of rifled, breech loading, and repeating rifles advanced the capabilities of the infantry in terms of firepower, range, accuracy and battlefield lethality, developments to modernize the artillery around the world lagged behind the rifled musket due to the economic costs involved. Because of the cost “no country would face the cost of re-equipment.”  This would begin to change in the mid-1850s as the experience of the Crimean began to give new impetus to weapons development. However, a number of artillerymen and innovators began to experiment with breech loading and rifled cannon. These were not new ideas, and “when combined, they were first experimented with in England in 1745,” but it would take another hundred years before Italian Major Giovanni Cavalli developed “a cast iron gun, its bore cut with simple two groove rifling to accept an elongated projectile fitted with corresponding lugs that mated with the gun’s grooves.”  As Cavalli improved his design others in Europe designed rifled guns. In France Colonel Treuille de Bealieu designed a similar gun to Cavalli; but which fired a cylindrical projectile. Napoleon III who was himself authority on artillery ordered brass smoothbores to be rifled on Bealieu’s design. Swedish Baron Martin Wahrendorf “experimented with smaller, multiple-grooved rifling using lead-sheathed projectiles”  Cavalli’s guns were used by the Sardinian army, while the French deployed a number of theirs to Algeria and against the Austrians in Italy. In the 1850s three English inventors, Charles William Lancaster, Joseph Whitworth, and William George Armstrong began to develop rifled guns. During the Crimean War the British Army modified some old large-caliber guns as breech-loaders. The “first British rifled ordnance consisted of a few old 68-pr and 8-in. cast iron guns, which were made oval and twisted in the bore and so converted to pieces rifled on the Lancaster principle.”  Some of these guns saw action during the siege of Sevastopol. Whitworth also produced a breech loading rifled cannon. His gun had a very long range and was exceptionally accurate, however the design was complex and temperamental, and the gun “ultimately proved impractical for general use.” This was in part due to their complexity and the “precise tolerances used in the manufacture… required meticulous maintenance by gun crews to avoid malfunctions, and even moderate bore wear led to jamming in the bores.”  A few Whitworth rifles were employed by the Confederate army during the Civil War, two seeing action in Richard Ewell’s Second Corps at Gettysburg. During the same time period a number of Americans both military, and civilian, began to develop their own variations of rifled cannon for use in the U.S. Army. The most important of these were Captain Robert Jackson Rodman and Captain Robert Parrott. Rodman was a true scientist who understood both metallurgy and gunpowder. Rodman was instrumental in using his knowledge to design the largest guns of the era. Called Columbiads, these heavy guns came in 8 inch, 10 inch, 15 inch and even a 20 inch model. They were used in coastal fortifications. In the 1870s over 200 of the 10 inch model were converted to 8 inch rifles. 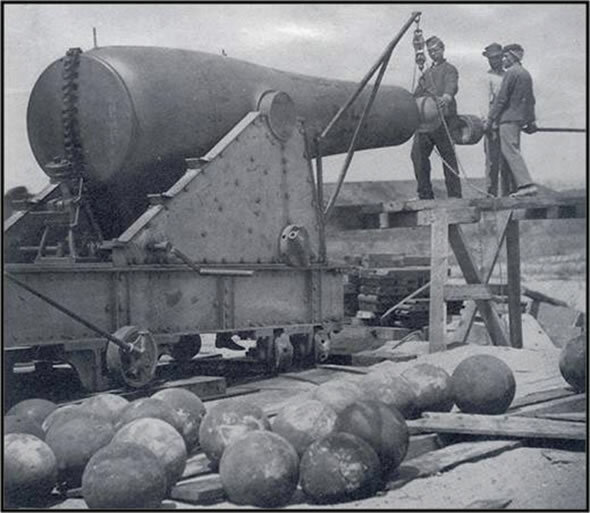 The Rodman guns remained in service the rest of the century and are considered to be the best cast-iron cannon ever produced. A civilian, John Griffen of the Phoenix Ironwork of Phoenixville, Pennsylvania,“pioneered the use of wrought iron in the construction of field pieces”  and patented his prototype in 1855. The designed was slightly modified by the Ordnance Department and adopted by the army in 1861. The weapon was known as the Ordnance Rifle and is had a bore of 3 inches and threw a 10-pound projectile. Unlike the cast iron Parrot, it was “constructed of tougher wrought iron, consisting of iron bands welded together around a mandrel and then lathed to a sleek, modern profile. It was then bored and rifled.”  The Ordnance rifles were light, easy to maneuver and beloved by their crews for their accuracy, and dependability. Phoenix manufactured over 1,000 of these weapons for the Federal government. I’ve been working on revisions to one of my Civil War texts, A Great War in a Revolutionary Age of Change and decided to post one of those today. Hopefully tomorrow I will follow up with the second part of this section, which deals with the development of artillery from the pre-Napoleonic era to the beginning of the American Civil War. This is kind of a post for geeks who study the period. This was in large part due to the work of Captain Alfred Mordecai, who traveled to France in 1833-1834 and collected data on the French development of the stock-rail system. His information, “which included detailed drawings, became the basis for U.S. prototypes of the design.”  An Ordnance officer, Mordecai went on to become head of the Frankford Arsenal and later was appointed to the Ordnance Board where he wrote the 1841 Ordnance Manual for the Use of Officers in the United States Army. Mordecai was instrumental in standardizing weapons types and carriages. The guns of his 1841 Pattern, 6- and 12-pound guns, as well as the 12-pound howitzer were all mounted on a standard carriage. Larger weapons, the 24- and 32- pound howitzers of the 1841 pattern were developed but did not see as much service due to their weight. Additionally, limbers and caissons were redesigned to lighten them and improve mobility. 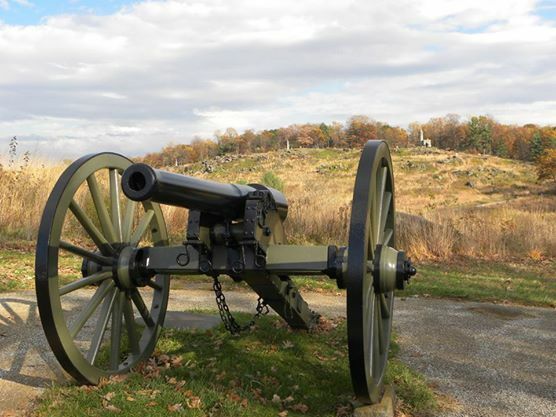 Though approaching obsolescence, many these guns saw action in early part of the Civil War and Confederate artilleryman Porter Alexander noted that the 24-pound howitzer was “his favorite gun”  for the effectiveness of its heavy shells and canister. Most of the improvements in artillery design between the Napoleonic era and the Civil War were on focused on lightening the weight of the tube, developing better and more mobile limbers, and improvements to fuses and ammunition. During this time the smoothbore cannon reached the apex of its development. In the United States this was realized with the brass M 1857 12-pound Napoleon, which was developed from a French design, however the gun “embodied none of the recent advances in technology” and was “already considered obsolescent by the French Army.”  However, much of the choice was dictated by purchasing agents and the budget which required any new ordnance to be cheap. The Napoleon was intended to replace the 1841 patter 6 and 12 pound guns and the 12 pound howitzer. It was nearly 500 pounds lighter than the old guns and “though it was technically a gun, owing to its ability to fire canister and solid shot, the Napoleon was often referred to as a gun-howitzer for its ability to fire explosive shell.”  It would see its first action at the Battle of Bull Run and nearly 1,800 of these versatile cannon would be produced in Northern and Confederate foundries during the war. Despite its obsolescence it “proved to be the most popular field piece during the Civil War,”  and Union artillery General Henry Hunt later acclaimed the Napoleon as “the best all round field piece of this era.”  Robert E. Lee told the Prussian observer to the Army of Northern Virginia, Justus Scheibert: “Nothing surpasses… the impression of a battery of 12-pound smoothbores which approaches to within 400-600 paces of the enemy…. In such moment rifled artillery, the advantages of which in open country I fully appreciate, cannot replace the smoothbore.”  Some of these guns remained in service until 1880. However, a number of artillerymen and innovators began to experiment with breech loading and rifled cannon. These were not new ideas, and “when combined, they were first experimented with in England in 1745,”  but it would take another hundred years before Italian Major Giovanni Cavalli developed “a cast iron gun, its bore cut with simple two groove rifling to accept an elongated projectile fitted with corresponding lugs that mated with the gun’s grooves.”  As Cavalli improved his design others in Europe designed rifled guns. In France Colonel Treuille de Bealieu designed a similar gun to Cavalli; but which fired a cylindrical projectile. Napoleon III who was himself authority on artillery ordered brass smoothbores to be rifled on Bealieu’s design. Swedish Baron Martin Wahrendorf “experimented with smaller, multiple-grooved rifling using lead-sheathed projectiles”  Cavalli’s guns were used by the Sardinian army, while the French deployed a number of theirs to Algeria and against the Austrians in Italy. A civilian, John Griffen of the Phoenix Ironwork of Phoenixville, Pennsylvania, “pioneered the use of wrought iron in the construction of field pieces”  and patented his prototype in 1855. The designed was slightly modified by the Ordnance Department and adopted by the army in 1861. The weapon was known as the Ordnance Rifle and is had a bore of 3 inches and threw a 10-pound projectile. Unlike the cast iron Parrot, it was “constructed of tougher wrought iron, consisting of iron bands welded together around a mandrel and then lathed to a sleek, modern profile. It was then bored and rifled.”  The Ordnance rifles were light, easy to maneuver and beloved by their crews for their accuracy, and dependability. Phoenix manufactured over 1,000 of these weapons for the Federal government.